On Tuesday, actresses Lori Laughlin and Felicity Huffman got busted for bribing elite schools will excess amounts of money and altering their children’s test scores so they can get into the top schools. 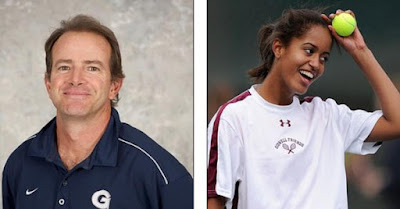 Along with the two actresses, 50 others were also indicted for being involved with the scheme, one of them being a former Georgetown University tennis coach who was the instructor for former First Lady Michelle Obama and her two daughters. The Tennis coach, Gordon Ernst, was formerly employed at Georgetown as the men’s and women’s head tennis coach at Georgetown. In exchange for the payoffs, Ernst allegedly designated at least a dozen applicants as recruits for the Georgetown tennis team, including some who did not play competitively, in order to help them get into the university. The money came from charitable accounts set up by the accused mastermind of the scheme, William Rick Singer, who founded the college consulting business Edge College & Career Network, also known as The Key, in Newport Beach, California. Prosecutors said parents paid Singer about $25 million to bribe coaches and administrators into pretending that their children were athletic recruits to guarantee their admission. In one instance, according to the documents, Ernst was allegedly paid $400,000 for getting the child of Singer’s clients into Georgetown under the guise of tennis recruitment, even though the applicant did not play competitive tennis. Between September 2015 and August 2016, Ernst allegedly received checks totaling $700,000. It’s interesting how whenever there is a big scandal, the Democrats and the Obama’s always seem to somehow be connected. During the Harvey Weinstein scandal, not only did we know that Weinstein had many ties to the Democrats, but we also found out that Malia Obama, the older Obama daughter, interned for the Weinstein company just months before the sexual assault scandal broke. I guess corrupt people always stick together! This is a sick abuse of power. Liberals are always lecturing us on “white privilege” yet these liberalHollywood actors are literally bribing these liberal colleges with large sums of money to get their liberal children in. These may be the most hypocritical people in the world! Talk about privilege! Like father like son, uhh I mean daughters. Ok, normally I do not ever stick up for the Obamas, however, this article implies and innuendo. Seems like a stretch that the Os were involved, it implies but just because he was their tennis coach doesn't mean he got Malia into Harvard. Plus last I heard she is sitting out a year. Fake news goes both ways. And I know that wasn't your point, sorry for the side car. Ok, normally I do not ever stick up for the Obamas, however, this article implies and innuendo. Seems like a stretch that the Os were involved, it implies but just because he was their tennis coach doesn't mean he got Malia into Harvard. Plus last I heard she is sitting out a year. Fake news goes both ways. Agreed Sage, let's not jump to conclusion. But if true, I don't think they'll get punished for their wrong doing. Who is your father and how much does he make. Same with me...the title of this article seems like click bait because the article does not prove the premise. Oh No........Not little hogg too. One thing to consider is if you are the offspring of a US Prez, you won't have to bribe the main liberal universities to let your child in. The prestige alone of being the child of a Prez is enough no matter whether you are qualified or not.